A blackberry bush stronghold, the runners of which must soon infiltrate the tomatoes [Credit: Darlene J Kreutzer, flickr.com]. The soil, nearly black with compost, is only recently emerged from alternating bands of ice and powder snow. The meltwater has rendered it a wallow. A wallow measuring two hundred fifty-eight square feet. Laid out in a neat rectangle, twenty-four feet on the long axis, eleven on the short. The corners describe (and the speed square confirms) perfect right angles. To accommodate the intrusion of a flight of stairs, I’ve biased the northwest corner, amputating a scalene triangle, three feet on one leg, four on another, fifty-four inches on the hypotenuse. This imperfection, too, is geometric. The U.S. Department of Agriculture advises that here, in Hardiness Zone 6B, average last frost occurs on April 13. Ten to thirty days prior, we’ll sow the beets and carrots, spaced two inches between plants, twelve between rows. The kale will follow soon thereafter, then spinach, cucumbers, beans and peppers. Finally tomatoes, eggplant and summer squash. All in tidy rows, the distances among plants prescribed by the Victory Seed Company of Molalla, Oregon. The incursion will begin on the eastern border, as always, with Japanese knotweed. The crimson shoots will appear delicate at first, soon revealing pencil-thick stems, then broom-handle bamboo stalks. 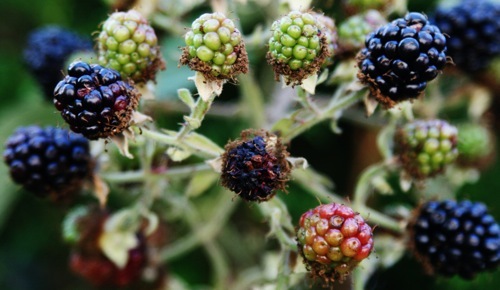 The blackberry will send out runners beneath the soil from its stronghold in the southeast corner, infiltrating the tomatoes. Broad Ailanthus shoots will appear overnight, a sudden Trojan horse amidst the peppers. We’ll subdue the invasions. We’ll uproot the foreigners, roughly prune the offending blackberry, decapitate the crabgrass with a hoe. We’ll defeat each successive wave of insurgents, all the while encouraging the hapless carrots. Absent our campaign, this battleground would tend towards wildness. The neighbors’ untended lot reveals our garden’s aspirations. A riot of purslane, plantain, curly dock, nettles, mustard, twelve-foot tall groves of knotweed, twenty-foot stands of Ailanthus. Their vigorous stems breach cracks in the concrete, lift it with tectonic force, reclaim all undefended territory. Euclidian geometry has no place here. Shade-grown coffee has its perks. Plants warn each other about impending threats.